Mt. Brennisteinsalda (translated Sulphur Wave), in the Landmannalaugar region, is one of the most colorful mountains in Iceland. 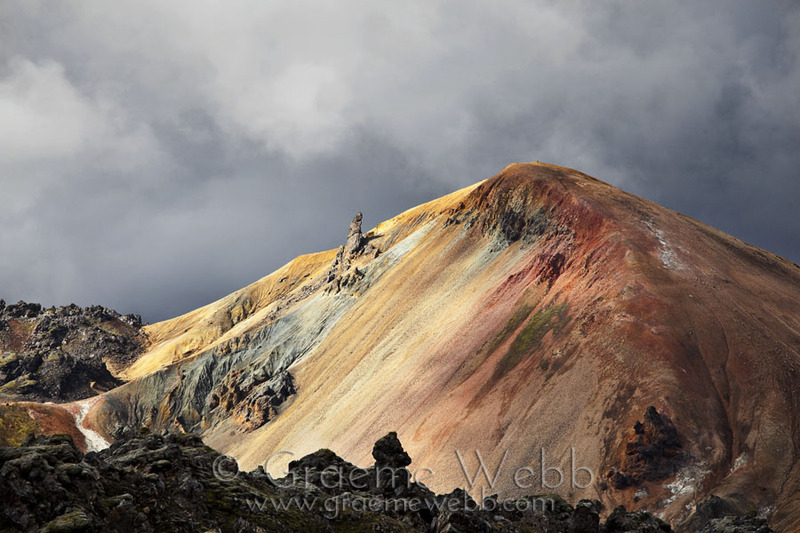 Sulphur, iron, lava and moss make up the yellow, red, black and green seen throughout the landscape here. The lava on the left and in foreground is only a small portion of a vast and ancient lava flow. The area is still very active as seen in the Eyjafyallajokull explosion of 2010, not too far from here. Lit against the brooding sky, the colors are intensified and make for an unforgettable sight.